Marrying stunning visuals with social advocacy, Rahul Jain’s debut documentary — winner of the Special Jury Award for Cinematography at the 2017 Sundance Film Festival — takes audiences into the labyrinthine passages of an enormous textile factory in Gujarat, India. 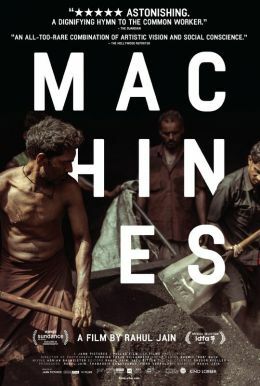 Jain’s camera wanders freely between pulsating machines and bubbling vats of dye to create a moving portrait of the human laborers who toil away there for 12 hours a day to eke out a meager living for their families back home. Interviews with these workers and the factory owners who employ them reveal the stark inequality and dangerous working conditions brought about by unregulated industrialization in the region.